Background: With its known benefits in other mental illnesses, there have been increasing interest to understand the effects of mindfulness-based intervention (MBI) in schizophrenia. The systematic review aimed to summarize and synthesize the evidence regarding the effectiveness of MBI for people with schizophrenia. Methods: The review was conducted according to the Preferred Reporting Items for Systematic reviews and meta-Analyses (PRISMA) statement. Relevant studies systematically searched from seven main electronic databases. The studies included were assessed for their methodological qualities using the standard Cochrane’s risk of bias assessment tool. Estimated effect sizes of the main study outcomes were calculated to assess/estimate the magnitude of the treatment effects of MBI in schizophrenia. Results: Six experimental studies were selected for inclusion in the analysis. The study results were not appropriate to be combined for meta-analysis due to marked variations in the study designs, interventions and reported outcome measures. The findings show that there are potential effects of MBI for patients with schizophrenia on emotional regulation, global functioning and prevention of relapse. However, there was insufficient evidence to indicate these promising effects. Conclusion: While mindfulness-based intervention may result in several benefits in schizophrenia, there is insufficient evidence to demonstrate its promising effects and evidence-based recommendations. More research is warranted to identify the therapeutic components and treatment effects of MBI in diverse samples with schizophrenia spectrum disorders. Schizophrenia is a severe mental illness often characterized by abnormal cognitive, volitional, perceptual, and behavioral manifestations such as persistent delusions, disorganized thinking, auditory hallucinations, social withdrawal, lack of motivation, and apathy . In 2013, there were about 24 million people with this disorder globally and its 12-month prevalence was 1.1-1.8% of adult populations . Although antipsychotic medications can reduce the psychotic symptoms (mainly positive symptoms), many psychotic patients continue to experience disabling residual symptoms and impaired functioning, as well as high risk of relapses from the illness. Recent systematic reviews on psycho-education and other psychosocial interventions in schizophrenia suggest that psycho-education and behavioural management programmes (in either individual or group basis) are consistently effective in reducing relapse and enhancing medication adherence [1,3,4]. Nevertheless, most of these psychosocial interventions only provide limited strategies in motivating and empowering self-management of the illness and pay little attention towards helping people develop an acceptance of the illness and the incomprehensible and stressful experiences of psychotic symptoms [1,4]. Therefore, the benefits of psychosocial interventions seem to be short to medium term with only slight improvements in psychosocial functioning, resulting in the general pattern of unsuccessful long-term coping or adjustments in the recurrent courses of schizophrenia. An evidence-based psychological therapy for a few mental illnesses such as depression and anxiety disorders named mindfulness-based intervention (MBI) has been increasingly attracted attention and interest in applying to the treatment of schizophrenia and other psychotic disorders. Mindfulness refers to the awareness of and focused attention to one’s own moment to moment experiences with a nonjudgmental and acceptance stance . Mindfulness requires intentionally observes and explores one’s inner experience with calmness and non-reactivity. Through mindful training and exercises, an individual can learn to accept his/her thoughts and feelings and to let go his/her dysfunctional cognitive, emotional and behavioral manifestations . Therefore, mindfulness training can improve one’s ability to regulate emotion and thought process in a more constructive manner and responses . Previous studies have indicated that MBI can be effective in improving psychosocial functioning for healthy people and a variety of illness conditions, ranging from pain, stress, anxiety, severe and recurrent depression disorders, and eating disorders . Schizophrenia is a chronic illness condition with persistent abnormal perception and cognition, particularly hallucinations and delusions. Despite psychopharmacological treatment, patients with schizophrenia continue to experience residual psychotic symptoms resulting in bizarre behaviors, significant distress, emotional disturbance, and gradual functional impairments . Patients conventionally adopted experiential avoidance strategies such as distraction, avoidance and suppression; some even get lost in the struggle of rumination and confrontation of symptoms . This avoidance approach exacerbates distress and anxiety, which are strongly associated with risk of relapse and re-hospitalization . Mindfulness-based intervention (MBI) is believed to help patients with schizophrenia relate differently to their psychotic experiences by opening their awareness and non-judgmental acceptance and allow a more adaptive strategy of coping and control over those psychotic symptoms to be used by patients with schizophrenia [11,12]. A few qualitative research reported that MBI could promote a range of benefits for patients with psychotic disorders. The patients with schizophrenia in the studies reported that they reclaimed one’s power by letting the psychotic symptoms to come and go without exaggerated negative reactions. MBI may empower one’s ability to accept and tolerate various difficult/negative thoughts and feelings, and achieve a sense of greater calm and peace of mind . Despite a few studies reported MBI could be potentially harmful by exacerbating patients’ psychotic symptoms, growing evidence have suggested the MBI can be effective to reinforce and empower patients’ self-regulation and management of the illness. To understand the effects of MBI for people with schizophrenia, this systematic review was to summarize and synthesize the current research evidence on the effectiveness and feasibility of MBI for people with schizophrenia. Hence, it can provide recommendations on the use of MBI for practice and further research. The protocol was registered in PROSPERO International prospective register of systematic reviews (PROSPERO 2016:CRD42016039718); and this proposal is available at http://www.crd.york.ac.uk/PROSPERO/display_record. asp?ID=CRD42016039718. The review identified the published peerreviewed journal articles and theses in English language. Systematic searching was made on six electronic databases: COCHRANE library, MEDLINE (1961-2016), CINAHL (1960- 2016), Ovid Full-text (1980-2016), PsychINFO (1940-2016), PubMed, and EMBASE (1960- 2016). A manual search was also made on Google Scholar, the university libraries, and references lists of all retrieved literature to identify any missing papers from the electronic database searches. In addition, we contacted key authors in mindfulness research to enquire about any potential grey literature. The search strategy to identify relevant papers involved a MESH (or INDEXTERM) term ‘schizophrenia’ and keywords ‘psychot*’, ‘psychos*’, ‘schizophreni*’, ‘serious mental disorder’, and ‘severe mental illness’ (and its combinations) for illness condition. In addition, intervention search terms were also included: ‘mindfulness’, ‘mindful*’, ‘meditation’, ‘MCBT’, and ‘MBSR’. Again, we had used the above search terms to search all the trials registers and databases. A sample search strategy was provided in Table 1. Table 1: Results of literature search with keywords. The review considered any randomizedcontrolled trials (RCTs) or experimental studies (published between January 2000-April 2016) that evaluated the effectiveness MBI for people with schizophrenia. These studies tested the effectiveness of MBI as an adjunct therapy with treatment-as-usual (TAU), compared with TAU alone or an active control, and over different follow-up periods. Studies that used quasiexperimental or single-group, pre-test and posttest design, cross-sectional design, qualitative methods, or case report was excluded. Participants included those patients aged 18 years and older, with more than 50% of participants with a formal clinical diagnosis of one of the schizophrenia spectrum disorders, according to the criteria of Diagnostic and Statistical Manual, DSM-IV-TR (and the latest DSM-V), or ICD-10 classification of mental disorders. Schizophrenia-spectrum disorders mainly included schizophrenia, schizoaffective disorder, delusional disorder, schizotypal personality disorder, schizophreniform disorder, and brief psychotic disorder. Interventions of interest were the interventions adopting mindfulness training as the primary component to examine their treatment effects to patients with schizophrenia spectrum disorders. These interventions included but not be limited to face-to-face, individual or group, and telephone and/or internet modes of MBI. The review excluded those trials that: (a) did not aim to examine treatment effects; (b) examined mindfulness as an adjunct but not the main component of another psychological treatment such as yoga-based, Acceptance and Commitment therapy-based, and other related psychological interventions. This review examined the effectiveness of the MBI and thus those sstudies had used mindfulness as an adjunct component of another treatment increased difficulties in dissociating the effect of mindfulness from other components and thus unable to draw meaningful conclusions on this particular emerging field of applied research . Primary outcomes in this review were patients’ emotional regulation, global functioning, indicators for illness relapse/recurrence such as hospitalizations, and suicide and all causes of mortality. Secondary outcomes included overall symptomatology, level of mindfulness, quality of life, indicators for symptoms control such as compliance with medication and coping ability. The review also included other possible outcomes such as behavioral changes and economic benefits induced by the intervention. The database search identified all potentially relevant studies based on the information contained in the title, abstract and descriptor/ MeSH headings. The studies were assessed against the inclusion and exclusion criteria by two independent reviewers (the first author and one research assistant) to ensure the studies could be classified correctly. Disagreements between reviewers on the articles with unlcear eligibilties were resolved by discussion and consensus made. The reviewer developed an electronic data extraction sheet, pilot-tested it on randomlyselected studies to be reviewed, and refined it accordingly. Full text articles were then obtained and read in detail independently by the two reviewers. Data collection was conducted in May 2016 and updated again in July of 2016. Only the latest reports were included when duplication occurred. Study data were extracted independently by the first and second authors and compared in order minimize errors in data extraction or their subsequent use for analysis. Information were extracted from the trial based on the characteristics of: (a) the trial (including the year of publication, design, randomization, concealment of allocation, blinding, number of participants, types of outcome measures, and follow-up periods in weeks); (b) the intervention(s) used (including treatment protocol, target population, treatment settings, length of treatment, attendance in number of sessions, and length of home practice in hours); (c) the comparison groups (including the number of participants, types of control, types of treatment, and length of treatment); and (d) the participants (including mean age, gender, diagnosis, duration of disease, education level, and work backgrounds). 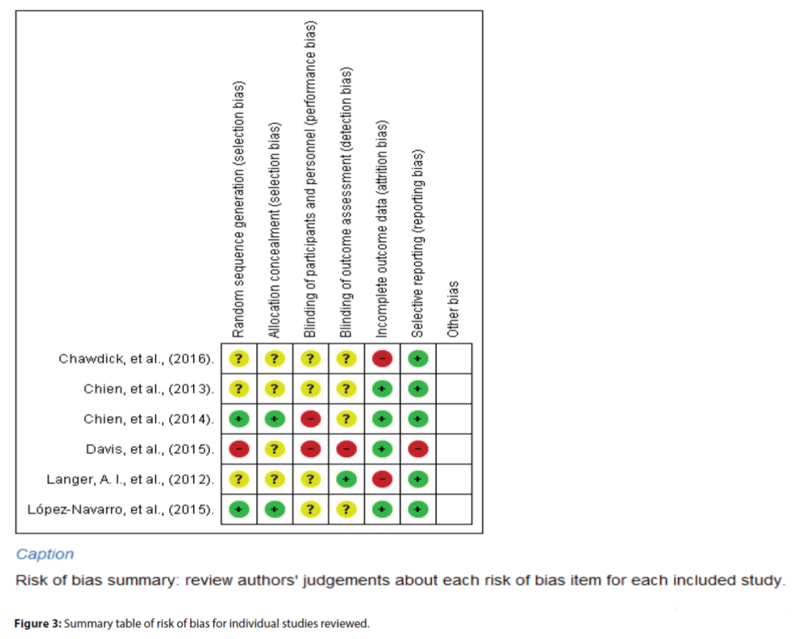 An external expert reviewer in systematic review independently assessed the risk of bias using the Cochrane Collaborations’ risk of bias assessment tool (Table 8.5a in the Cochrane Handbook for Systematic Reviews of Interventions) , which assessed the random sequence generation, allocation concealment, patient and personnel blinding, assessor blinding, incomplete outcome data, and selective outcome reporting. The use of this external reviewer could avoid potential conflicts of interest as the authors were closely involved in research on this topic. The relevant information was extracted from each study and finally rated as ‘high risk’, ‘low risk’ or ‘unclear risk’, according to the criteria from the Cochrane assessment tool. Disagreements were resolved by consensus. The review used RevMan 5.1 (Review Manager 5.1) to compute graphic representations of potential bias. The reviewer considered each item in the risk of bias assessment independently without an attempt to collate and assign an overall score. The item ad final scores and reasons for these ratings were discussed among the research team in details so as to reach an objective agreement of the quality of each study reviewed. Indeed, the bias assessment results were not used to determine the inclusion criteria of these reviewed studies. Due to very much heterogeneity of the outcome measures (i.e., a few heterogeneity indexes: Tau-square= .49- .82, Chi-square= 2.3-4.5, p= .15 - .30, I2= 15-30%) and thus the study findings, the review had to do the summary of the pooled results narratively with descriptive statistics, and textual descriptions and tables. Detail summaries presented for each of the studies reviewed included the main characteristics of the study reviewed such as total number of studies included, methods used and sample sizes, the findings regarding their effectiveness (in terms of the main outcomes) and feasibility, the quality of evidence, and their limitations and recommendations. To measure the magnitude of treatment effects, this review reported the estimated effect sizes (ES) for the continuous outcomes of all studies included and which were calculated with the formulas described by Lipsey and David , by dividing the difference of mean scores of one study outcome between two groups with the pooled standard deviation. For studies contained 3 or more study groups, the ES were calculated with F values, as again suggested by Lipsey and David 15. Using Cohen’s recommendations, effect sizes of interventions on psychosocial outcomes were leveled as: trivial (Cohen’s d ≤ .20), small (>.20), moderate (> .50), large (>.80), and very large (>1.30) . A total of 1,438 articles were retrieved from the electronic databases and manual search up to 31 July 2016. After removing those duplicates, 1,275 studies remained and were screened. About 1,250 records were removed after screening the relevance of article titles and abstracts to the topic of the review. The full texts of the remaining 21 studies were reviewed and finally 15 studies were excluded after full review, leaving behind only six studies [17-22] to be included for this review. Details of the searching process are shown in Figure 1. Figure 1: Results of literature search in PRISMA flow diagram. In the six randomized controlled studies, two were pre- and post-test design [20,21] and the other studies (n= 4) [17-19,22] used repeatedmeasures design with varied follow-up periods from 6 months  to 2 years . Most of the participants were male (mean 61%, median 59.3%, range 49.5%-97.1%) and middle-aged (mean 36.4, range 25.6-51.7). Two studies had conducted in people with recentonset psychosis (i.e., duration of illness < 5 years) [18,19]. One multicenter controlled trial targeted patients with distressing residual psychotic symptoms . Most patients were diagnosed with schizophrenia (58.8%-38.2%); other patients were mainly diagnosed of schizoaffective disorders (9.5% - 66.6%), depressive disorder with psychotic feature (20.4% - 41.1%) and delusional disorder (4.7%). Four studies recruited patients with schizophrenia spectrum disorders according to DSM-IV but without reporting on the patient diagnoses [19-22]. The duration of the illness ranged from 2.6 (SD= 1.8) to 14.0 (SD=7.0) years. Only one study reported the lifetime hospitalization in the demographic characteristics, with an average of 4.4 years . All studies reported the participants’ education levels, mainly high school education (55.3%) or average years of schooling 9.3 (SD= 2.8). Two studies reported patients’ working status, mainly unemployed (86.5%) [17,20]. The six reviewed studies are summarized in Table 2. The studies were conducted in the U.S., U.K., Spain, and Hong Kong and three of them were multicenter trials [17-19]. Four studies focused on patients in community mental health settings, while 2 studies conducted in outpatient clinics [18-19]. All studies provided group-based mindfulness-based intervention; in which, two adopt solely mindfulness without combining to any other intervention [18,20]. Davis et al. developed the Mindfulness Intervention for Rehabilitation and Recovery in Schizophrenia, which was integrated mindfulness into work counseling . Chien and Lee  and Chien and Thompson  combined mindfulness training into a well-established psychoeducation programme. Chadwick et al. integrated a person-based cognitive therapy into the MBI. (a) A weekly 90-min group sessions for work related discussion and support. Table 2: Summary of studies of MBI for people with schizophrenia. The MBI in these reviewed studies engaged patients in mindfulness training, home and within-session practices and reflective discussions, supplemented with CD or audiotapes for selfpractices. The structure of the interventions varied much in terms of length of each session and guidance of mindful exercises. Three studies introduced only one technique of mindfulness [18,19,22], while the other three studies instructed different mindfulness exercises; and however, homework and self-practices were not compulsory in most of the studies. Regular selfpractice was a key component of the program possibly to enhance treatment effects; whereas, more practice was associated with symptoms improvement [23,24]. Besides, the frequency and duration of the interventions varied from twice a week to biweekly, and 60 to 120 minutes. Nevertheless, the total number of sessions was mainly 12 sessions (i.e., standardized for MBI programs), except Davis et al.’s 32-session  and Langer et al.’s  8-session programs. Indeed, the variations between the six MBI programs used in the reviewed studies may limit the potential generalization and replications of the intervention in future research and practice. Regarding the control group used, one study used waiting-list controls  and two only adopted treatment-as-usual (TAU) controls [17-18]; whereas, the remaining three studies adopted active control groups, including Intensive Support for work-related issues , integrated rehabilitation treatment  and conventional psycho-education program . Figures 2 and 3 indicated the item-based risk of biases and the bias assessment of the included individual studies. Figure 2: Risk of bias graph. Figure 3: Summary table of risk of bias for individual studies reviewed. The study of Davis et al. randomized the participants in blocks of four, creating a relatively high risk of sequence generation. Three studies were ranked as ‘unclear risk’ because they did not describe the randomized sequence generation [17,18,20]. Two studies were in low risk of sequence generation by using computerized randomization and opaque envelope [19,21]. For allocation concealment, four studies did not describe how the allocation was performed [17,18,20,22]; the allocation concealments were therefore rated as ‘unclear’. The other two studies were in low risk of allocation concealment due to its clear description of the allocation concealment. Most studies were at high risk of performance bias (blinding of participants and personnel) due to the nature of the intervention used (i.e., the mindfulness intervention). The authors themselves led the MBI in Davis et al.’s  study; and Chien and Thompson  highlighted the research team’s training on the psychiatric nurses, which violated the blinding of personnel in the study settings. Therefore, the blinding of personnel in these two studies were rated ‘high risk’, while the other four studies did not describe the blinding of personnel and thus were rated ‘unclear’. All studies adopted self-reported measures, in which four studies assigned blinded assessors to measure the study outcomes. The detection biases (blinding of outcome assessment) were rated as ‘unclear’. Davis et al. assigned a graduate psychologist experienced in mindfulness training to assess the study outcomes and thus its detection bias could be rated as ‘high risk’. In addition, five studies were in low risk of attrition bias with a loss to follow-up of 20% or less. Two studies were rated ‘high risk’ in this bias because of its high loss to follow-up (>20%) [17,20]. For reporting bias, most of the studies clearly reported all the results according to the protocol and thus they were rated ‘low risk’ in the selective reporting bias [17-21]. Only Davis et al.’s  study failed to describe all of the main outcomes listed in the protocol, thus being rated ‘high risk’ on selective reporting bias. Table 2 shows the results of the six studies in terms of their study design, number of participants, randomization, types of intervention and control groups, and outcome measures at both post-treatment and the last follow-up. Table 3 shows the effect sizes of MBI on each of the main study outcomes. Because the study design, intervention and reported outcome measures varied markedly, the article focused on describing the studies including the results and the limitations on descriptive synthesis. Table 3: Effect sizes of MBI on various patient outcomes at follow-ups. Only one RCT investigated the effect of MBI on emotional regulation. Chadwick et al. measured patients’ distress and anxiety with Hospital Anxiety and Depression (HADS), and the clinicians’ rating on Psychotic Symptom Rating Scale - distress intensity (PSYRATS). There were significant between-group differences in HADS depression and PSYRATS, with small to moderate effect size (Cohen’s d= -0.38 for HADS depression and -.50 for PSYRATS or distress intensity). A significant between-group difference was maintained on HADS depression with small effect size (d= - .36) at 6-month post-intervention. However, the studied did not demonstrate between-group difference of MBI on CORE-OM and HAD anxiety at posttreatment or 6-month follow-up, indicating there were no improvements on patients’ anxiety and general psychological symptoms after completion of the intervention. The study from Chien and Thompson  demonstrated MBI significantly improved schizophrenia patients’ psychosocial functioning by using Specific Level of Functioning Scale (SLOF), with moderate effect size (d= .54). The significant between-group difference could be sustained to both 12-month and 24-month post-intervention (d= .55 at 12-month and .57 at 24-month follow-up). Another study from Chien and Lee  also demonstrated a significant between-group difference on SLOF score at 18-month follow-up with moderate effect size (d= .57). Two studies by Chien and his research team measured the effects of MBI on preventing relapse from the illness [18,19]. These studies measured the average number of re-hospitalizations and duration of re-hospitalizations to indicate the participants’ relapse rate. Their study in 2013 demonstrated significant betweengroup differences on participants’ number and duration of re-hospitalizations over 18-month follow-up, with moderate and large effect size, respectively (for average number of admissions, d= - .52 at 18-month follow-up; for duration of re-admission, d= - .87 and -1.27 at immediately and 18-month post-intervention, respectively) . Another Chien’s study also showed significant between-group differences on the duration of re-hospitalizations at immediately, 12- and 24-month post-intervention with mainly moderate effect sizes (d= .38 to .56) . For the secondary outcomes, all studies measured the symptoms severity by using different measurement tools. Both studies of Chien et al. [18,19] demonstrated significant betweengroup differences on the Brief Psychiatric Rating Scale (BPRS) at post-intervention, with small to moderate effect size (d= - .36 and .57, respectively). Their study in 2013 showed the effect was maintained at 18-month follow-up (moderate effect size, d= -0.674);  whereas, the study in 2014 showed the sustainable effect of MBI at 12-month and 24-month follow-up with moderate effect sizes (d= .52 at 12-month and .55 at 24-month follow-up) . Langer et al. evaluated their patients’ symptoms with the use of Clinical Global Impression – Schizophrenia Scale (CGI-SCH). The results demonstrated the moderate effect size in CGI-SCH (d= - .66), despite the change not reaching significant between-group difference. This might be due to the study had a very small sample size (n=18), thus having inadequate power. Indeed, Lopez-Navarro et al. and Chadwick et al. measured symptom severity with the use of Positive and Negative Syndrome Scale (PANSS) and Psychiatric Symptom Rating Scale (PSYRATS), respectively. Both studies failed to show a significant between-group difference on symptom improvement after MBI. However, Langer, et al. showed the MBI significantly improved patients’ mindfulness response as showed by the Southampton Mindfulness Questionnaire (SMQ), exhibiting a large effect size (d= 1.20). On the other hand, Lopez-Navarro, et al. did not show statistically significant between-group difference in Mindfulness Attention Awareness Scale (MAAS), with a small effect size only (d= .21). In addition, only one RCT investigated the effect of MBI on participants’ quality of life. Lopez-Navarro, et al. investigated the effect of MBI on patients’ quality of life using the World Health Organization Quality of Life- BREF (WHOQOL-BREF). The results showed the MBI program significantly improved the patients’ psychological health-related quality of life, with a moderate effect size (d=.63). But the MBI did not show significant improvements in their life satisfaction in terms of physical, social and environment aspects, when compared to the control group. Furthermore, Chadwick et al. identified the patients’ overall level of recovery using the Choice of Outcome in CBT for Psychoses (CHOICE). There was significant betweengroup effect on CHOICE-satisfaction after the intervention (d= .38), representing one’s satisfaction on enhancing their self-confidence and coping with stress . However, the effect could not sustain to the 6-month follow-up. In addition, there is no significant betweengroup difference on CHOICE-severity, which measured the symptom disruption and control (d= .35 at post-intervention and .31 at 6-month follow-up). Langer, et al. measured the effect of MBI on patients’ experiential avoidance (i.e., the willingness to experience unwanted private events) using the Acceptance and Action Scale (AAQ II). The MBI did not show significant improvement on AAQ II at post-intervention. Chien et al. [18,19] measured the effects of mindfulness-based psyechoeducation intervention on patients’ awareness of and insight into illness and treatment with Insight and Treatment Attitudes Questionnaire (ITAQ). Both studies showed significant between-group differences in the ITAQ scores at post-intervention, with moderate to large effect size (d=1.26 and 0.60, respectively). Study in 2013 showed the effect was maintained at 18-month follow-up, with very large effect size (d= 2.00) . Chien et al.’s study in 2014 also demonstrated significant between-group differences at 12- and 24-month follow-up, with moderate effect sizes (d= .68 and .72 in 12- and 24-month follow-up, respectively) . These two studies also examined the effect on patients’ satisfaction with the social support available in one’s immediate social environment by using Social Support Questionnaire (SSQ) but failed to demonstrate its significant improvement on SSQ score after MBI. For other study outcomes, Davis et al. investigated the effect of a MBI rehabilitation program on work performance. The work performance was measured by the Work Behavior Inventory (WBI). There was a significant between-group difference in WBI after post-intervention, with a large effect size (d= 1.06) and a substantive large effect at 6-month post intervention (d= .89). There were also significant between-group differences on the WBI subscales - WBI work quality and QBI personal presentation, with large effect sizes (both d= .91). Recently, there has been emerging attention and increasing research on the effects of mindfulnessbased intervention (MBI) in schizophrenia spectrum disorders. This review examined the current research evidence on the effectiveness of MBI for people with schizophrenia on a variety of patient outcomes over different periods of follow-up. The findings of this review show that although only six controlled trials have been identified, there are encouraging effects of MBI for these patients on a few important clinical outcomes, such as psychosocial functioning, work behaviors, psychiatric symptoms, depression, psychological distress, and relapse rate in short-term. In addition, there are also a few postive effects found over a longer-term (12-24 months) follow-up on these patients’ functioning, psychotic symptoms, insight into the illness, and relapse prevention [18,19]. However, there have not yet sufficient and conclusive evidence to indicate these promising effects due to limited number (n=6) and fairly satisfactory quality of controlled trials identified in the past decades. In addition, few studies adopted rigorous or high quality study design and half of the reivewed studies mainly had small sample size (i.e., 18-44 sample) and violations on selection, performance, detection, and reporting biases, which have threatened the internal and external validity of the findings. Half of the reviewed studies did not mention the sample size calculation, thus failing to ensure sufficient statistical power. In addition, most of the significant improvements on the patient outcomes were found in two to three studies identified [17-19], which had relatively larger sample size and higher quality of study design. A few significant improved patient outcomes, for instance, the global functioning and insight into the illness and its treatments, were measured in the two studies of culturally-adopted MBI by the same research team in Hong Kong. These two studies might involve similar patient groups, study settings and treatment protocols, raising uncertainty about the replication of the findings and implications. This review observed a few similar limitations to another systematic review on the effects of MBI by Strauss et al. . The review reported that there was a lack of consensus on the therapeutic ingredients or components of the MBI used, its specific effects to the target patient groups, and the primary and other main study outcomes to be focused in the controlled trials. As the study outcomes have varied much in the reviewed studies, it would be hard to answer on the mechanism of therapeutic actions, or how the MBI induced positive changes among participants. Surprisingly, there are only few controlled trials investigating about the effect of MBI on emotional regulation, which may be the key functions of this approach to psychological therapy . The emotional regulation of people with schizophrenia can contribute to an improvement of one’s global functioning and psychological distress due to psychotic symptoms; whereas, mood instability is a prominent feature of schizophrenia, as well as patients’ relapse from the illness [27,28]. While MBI aims to promote a sense of calmness and confidence to accept negative and distressed thoughts and feelings, there is a need for better understanding the therapeutic effect of MBI on emotional regulation in people with schziophrenia, particualarly those with persistent halluciation and/or delusion. In addition, there were only two studies investigated the illness relapse or recurrence, assessing merely on patients’ duration and length of re-hospitalizations [18,19]. Relapse prevention is crucial in schziophrenia because each relapse increases a psychotic patient’s residual symptoms and cotninuous, gradual functional impairments and disabilities, leading to disruption of one’s life and burdens on family and carers [1,29]. Therefore, there are very high re-admission rates of people with schizophrenia spectrum disorders due to symptom recurrrence and relapse, with a prevalence of 30-50% in one year and 70% in 10 years [30,31]. This high risk of re-hospitalization or relapse in schziophrenia has raised much concern globally because this can create a huge demand for mental health care services and the related costs, as well as the overall disease burden in societies [2,30]. While the current evidence has showed that MBI may benefit in reduction of duration (or number) of re-hospitalizations, further investigation is recommended to capture this cost-benefit and other longerterm benefits such as utlization of health care services, mortality and co-morbidities, as well as patients’ integration into the communtiy and producitivity in work and family care. This can then prove the possibility of changing the overall trajectory of schizophrenia. The structure of MBI programs highly varied in the six reviewed studies. A few trials only instructed one main mindfulness technique, while the other studies taught a few mindful techniques such as body scan and sensation, mindful breathing, walking and siting meditation, and stress responses. The frequency and duration of the interventions also varied from 4 to 14 sessions and one to three hours, respectively. This diversity of the MBI programs used may not help us find out the optimal and acceptable structure, content and frequency/ duration of MBI for people with schizophrenia, resulting in higher attendance or completion rate (or lower attrition rate; whereas, 6-18% in the reviewed studies) and better patient outcomes. Indeed, these variations would limit the potential for generalization and replication of this MBI program in research and practice. Furthermore, most of the studies did not request for very formal (or regular) home practices. Crane et al. discovered the strong association between the level/length of formal home mindful practices and the depressive patients’ desirable outcomes. It is evidenced that people who have engaged in more formal/regular home meditation practices would have a more significant lower risk of relapse from depression over 12 months , and thus, this may also be applied to schizophrenia and other severe mental illnesses. Unfortunately, there was only one of the six reviewed studies recorded the patients’ duration of home practices  and thus we cannot decide the optimal dose/amount of mindfulness practices to bring out most positive patient outcomes in the trials and hence provide guidance for clinicians to work out the most appropriate pattern of home exercises for the users. A few controlled trials in this review integrated the MBI into another conventional intervention such as psycho-education, work counseling and cognitive therapy. These trials have demonstrated very desirable patient outcomes, when compared with the control groups. For instance, Chien et al.’s [18,19] studies demonstrated that the integrated mindfulness and psycho-education program significantly improved a variety of patient outcomes, including psychotic symptoms, insight into illness and treatment, psychosocial functioning, and average duration of re-admissions. Chadwick, et al. also demonstrated that Person-based Cognitive Therapy incorporated with mindfulness training to be the main component sustainably reduced the patients’ psychological distress regarding hallucinations over 6 months followup. Mindfulness alone solely engage participants in recognizing and accepting the internal events without explicitly focusing and reinforcing on skills/technique of behavioral change and illness management. A combination of mindfulness to other psychological therapies entails the notion of ‘theoretical integration’, which integrates different principles of psychological therapies from two or more approaches in order to amplify or synergize the therapeutic purposes and objectives of MBI [33,34]. An integrated MBI program may provide more comprehensive and some unexpected therapeutic effects to people with schizophrenia. Further research may investigate the most optimal combination and synergetic effects of any integrated MBI, together with one or more conventional interventions, and which may target for specific goals or benefits to any subgroups of schizophrenia spectrum disorders. Because of much varying study design, structure of intervention and patient outcomes used, we could not perform a meta-analysis in this review and thus the findings on the effects of MBI are less conclusive and valid. The review only included experimental studies published in peer-reviewed journals using English language and any unpublished research and relevant literature in other languages or other forms of publications were excluded. This could limit the generalizability and validity of the findings of this review. The results of risk of bias assessment showed much violations and various types of biases according to the valid Cochrane Collaboration’s assessment tool are found among the six reviewed studies, leading to possible under-powering the quality of the reported results and/or over- or under-estimate their treatment effects. For instance, the pooled samples are predominated with male (61.0%) and unemployed (86.5%) patients. These samples might not be representative to the patient populations, thus reducing the generalization of their reported results/effects of MBI participation. Nevertheless, the reviewed studies included different phases of schizophrenia, varying from early, recent-onset to chronic schizophrenia. This inclusion of heterogeneous subjects in terms of illness conditions/phases could have been useful to understand the wider applicability of MBI in different stages of schizophrenia. Lastly, this review included the randomized controlled trials but neither that with other study methods/designs nor those with mixed methods or qualitative exploratory approaches, and that would limit the comprehensive or in-depth understanding of the process, perceived benefits and different clinical outcomes of MBI in schizophrenia. The highly varied structure and content of the intervention used in the reviewed trials might also create threats to the internal or conclusive validity [35,36]. There is insufficient evidence on the significant positive effects of MBI for people with schizophrenia on important or long-term clinical outcomes. The mechanisms of the therapeutic actions of MBI in schizophrenia are uncertain or unexplored. This review has identified several knowledge gaps for future research. First, further research can be conducted to clearly identify the mechanism of actions and key therapeutic effects of MBI on crucial patient outcomes, including emotional regulation, various aspects of functioning, selfempowerment, and efficacy and ability of illness management. Second, it is also important and useful to investigate the long-term benefits of MBI such as relapse prevention and quality of life, as well as cost-effectiveness in diverse groups of schizophrenia spectrum disorders. Third, high-quality randomized controlled trials with larger-sized sample should be used to increase the power of the study and validity of the findings. However, treatment protocols adopted in the current trials highly varied, thus limiting the consistency and replicability of MBI program delivered for research and practice. Identifying the therapeutic components of MBI may help in assuring the standardization of the treatment protocol. Finally, it is useful to examine the optimal/desirable effects of any integrated MBI with other approach (es) to psychosocial intervention(s). Further research may investigate the feasibility and effectiveness of an integrated use of such combined approaches to psychological interventions so as to provide holistic and synergetic treatment effects to these psychotic patients with treatment-resistant or recurrent and chronic illness condition. There is an increasing recognition of the potential therapeutic effects of MBI for patients with schizophrenia. While a few recent pilot studies have demonstrated its flexibility and acceptance to people with schizophrenia 17, this review shows that MBI may have significant benefits to patients with recent-onset or chronic schizophrenia on inducing insight into the illness and symptom control, as well as a few aspects of functioning. However, there are only six controlled trials found to demonstrate such promising evidence, leaving rooms for further research with larger-sized sample and longerterm follow-up. The review also reveals that there is a lack of standardized treatment protocol or common primary or main outcomes used in the reviewed studies, making firmly conclusions or recommendations on the intervention and its treatment effects more difficult. Therefore, further research should focus on adequate powered randomized controlled trials with diverse patient characteristics and long-term follow-up, as well as a standardized treatment protocol and a few similar patient outcomes to recent research. The authors have declared that they have no conflict of interest in relation to the conduct of this review. However, Prof. Chien would like to declare that two of the reviewed articles were conducted by his research team. Indepednent and blind review of the retrieved articles by the first author ensured that there is no bias in the review process. The study was supported by the General Research Fund (PolyU 156038/15H) of The University Grant Council, Hong Kong S.A.R., China. Chien WT, Yip ALK. Current approaches to treatments for schizophrenia spectrum disorders, Part I: an overview and medical treatments. Neuropsychiatr. Dis. Treat9(1), 1311-1332 (2013). Global Burden of Disease Study 2013 Collaborators. Global, regional, and national incidence, prevalence, and years lived with disability for 301 acute and chronic diseases and injuries in 188 countries, 1990-2013: a systematic analysis for the Global Burden of Disease Study 2013. Lancet 386(1), 743-800 (2015). Xia J, Merinder LB, Belqamwar MR. Psychoeducation for schizophrenia. Cochrane. Database. Syst. Rev 6(1), CD002831 (2011). Pfammatter M, Junghan UM, Brenner HD. Efficacy of psychological therapy in schizophrenia: conclusions from meta-analyses. Schizophr. Bull32(1), 64-80 (2006). Kabat-Zinn J. Wherever You Go, There You Are: Mindfulness Meditation in Everyday Life. New York: Hyperion (1994). Davis LW, Strasburger AM, Brown LF. Mindfulness: an intervention for anxiety in schizophrenia. J. Psychosoc. Nurs. Ment. Health.Serv45(11), 23-29 (2007). Baer RA. Mindfulness training as a clinical intervention: a conceptual and empirical review. Clin. Psychol. Sci. Pract10(2), 125-143 (2003). Pratt SI, Mueser KT. Handbook of Assessment and Treatment Planning for PsycHological Disorders. (Barlow MMA& DH, ed.). New York: The Guilford Press, USA (2002). Jacobsen P, Morris E, Johns L, et al.Mindfulness groups for psychosis; key issues for implementation on an inpatient unit. Behav. Cogn. Psychother39(3), 349-353 (2011). van der Valk R, van de Waerdt S, Meijer CJ, et al. Feasibility of mindfulness-based therapy in patients recovering from a first psychotic episode: a pilot study. Early Interv. Psychiatry7(1), 64-70 (2013). Chadwick P, Taylor KN, Abba N. Mindfulness Groups for People with Psychosis. Behav. Cogn. Psychother33(3), 351-359 (2005). Strauss C, Thomas N, Hayward M. Can we respond mindfully to distressing voices? A systematic review of evidence for engagement, acceptability, effectiveness and mechanisms of change for mindfulness-based interventions for people distressed by hearing voices. Front. Psychol 6(1), 1154 (2015). York M. A qualitative study into the experience of individuals involved in a mindfulness group within an acute inpatient mental health unit. J. Psychiatr. Ment. Health.Nurs 14(6), 603-608 (2007). Higgins JPT, Altman DG, Gøtzsche PC, et al.The Cochrane Collaboration’s tool for assessing risk of bias in randomized trials. BMJ 343(1), d5928 (2011). Lipsey MW, Wilson DB. Practical Meta-Analysis. Thousand Oaks. CA: Sage Publications (2001). Cohen J. Statistical Power Analysis for the Behavioral Sciences, Hillsdale N.J.: L. Erlbaum Associates (1988). Chadwick P, Strauss C, Jones AM, et al.Group mindfulness-based intervention for distressing voices: A pragmatic randomized controlled trial. Schizophr. Res175(1-3), 168-173 (2016). Chien WT, Lee IYM. The mindfulness-based psychoeducation program for Chinese patients with schizophrenia. Psychiatr. Serv64(4), 376-379 (2013). Chien WT, Thompson DR. Effects of a mindfulness-based psychoeducationprogramme for Chinese patients with schizophrenia: 2-year follow-up. Br. J. Psychiatry205(1), 52-59 (2014). Langer ÁI, Cangas AJ, Salcedo E, et al.Applying mindfulness therapy in a group of psychotic individuals: A controlled study. Behav. Cogn. Psychother40(1), 105-109 (2012). López-Navarro E, Del Canto C, Belber M, et al.Mindfulness improves psychological quality of life in community-based patients with severe mental health problems: A pilot randomized clinical trial. Schizophr. Res168(1-2), 530-536 (2015). Davis LW, Lysaker PH, Kristeller JL, et al.Effect of mindfulness on vocational rehabilitation outcomes in stable phase schizophrenia. Psychol. Serv12(3), 303-312 (2015). Baer RA, Carmody J, Hunsinger M. Weekly change in mindfulness and perceived stress in a mindfulness-based stress reduction program. J. Clin. Psychol68(7), 755-765 (2012). Ong JC, Manber R, Segal Z, et al.A randomized controlled trial of mindfulness meditation for chronic insomnia. J. Sleep Disord. Res37(9):1553-1566 (2014). Lecomte T, Leclerc C, Wykes T. Group CBT for PsychosisÃ¢ÂÂ¯: A Guidebook for Clinicians. New York: Oxford Univerisity Press, USA. Cohn MA, Fredrickson BL, Brown SL, et al.Happiness unpacked: positive emotions increase life satisfaction by building resilience. Emotion 9(3), 361-368 (2009). Marwaha S, Broome MR, Bebbington PE, et al.Mood instability and psychosis: analyses of British national survey data. Schizophr. Bull40(2), 269-77 (2014). Rickwood D. Pathways of Recovery: Preventing Further Episodes of Mental Illness. Canberra(2005). Chi MH, Hsiao CY, Chen KC, et al.The readmission rate and medical cost of patients with schizophrenia after first hospitalization -A 10-year follow-up population-based study. Schizophr. Res170(1), 184-190 (2016). Vasudeva S, Narendra Kumar MS, Sekhar KC. Duration of first admission and its relation to the readmission rate in a psychiatry hospital. Indian J. Psychiatry51(4), 280-284 (2009). Crane C, Crane RS, Eames C, et al.The effects of amount of home meditation practice in Mindfulness Based Cognitive Therapy on hazard of relapse to depression in the Staying Well after Depression Trial. Behav. Res. Ther63(1), 17-24 (2014). Hassed C, de Lisle S, Sullivan G, et al.Enhancing the health of medical students: Outcomes of an integrated mindfulness and lifestyle program. Adv Heal. Sci. Educ. Theory.Pr14(3), 387-398 (2009). Cayoun BA. Mindfulness-Integrated CBT: Principles and Practice. United Kingdom: John Wiley & Sons, Ltd(2011). Yeung A, Shyu I, Fisher L, et al.Culturally sensitive collaborative treatment for depressed chineseamericans in primary care. Am. J. Public. Health100(12), 2397-402 (2010). Leykin Y, DeRubeis RJ. Allegiance in psychotherapy outcome research: separating association from bias. Clin. Psychol. Sci. Pract16(1), 54-65 (2009).